Since February 2009, the United Nations has observed the 21st of February as International Mother Language Day to promote linguistic and cultural diversity and multilingualism. Last year, we celebrated linguistic diversity with the Freedom to Read campaign, where our amazing community of co-creators helped us add stories in 13 new languages on StoryWeaver, for children to read and enjoy. Many of the languages added represented underserved and endangered linguistic minorities. This year, we carry forward the spirit of our first Freedom to Read campaign, in a more focussed manner by seeding hyperlocal (both print and digital) libraries in three minority languages: Konkani, Bhoti and Haryanvi. The Konkani Bhasha Mandal is Goa’s pioneering non-governmental institution striving for the cause of Konkani in social, educational, literary and cultural spheres. Since the launch of StoryWeaver, The Konkani Bhasha Mandal has been a steadfast supporter and collaborator. Passionate about strengthening the pool of children’s literature in Konkani, the organisation has translated over 100 books to the language on StoryWeaver and shared these stories digitally with children in schools who have enjoyed them tremendously. On the occasion of International Mother Language Day 2018, Pratham Books and the Konkani Bhasha Mandal have further strengthened their partnership and commitment to spreading the joy of reading by printing 25,000 copies of 50 Pratham Books titles in Konkani and distributing them freely to 250 schools in the region, impacting 25,000 primary school students. 50 Pratham Books titles, translated on StoryWeaver, printed and ready for classrooms. In the run up to International Mother Language Day, we conducted our first ever translation hackathon with 25 educators from across 20 districts in Haryana. 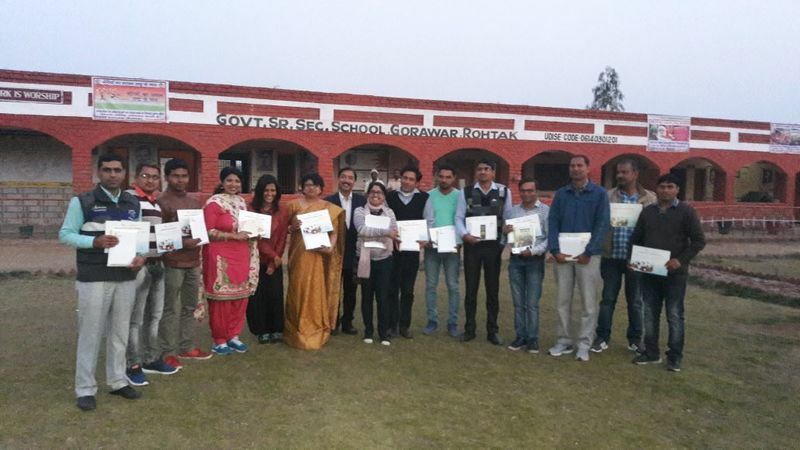 The two day, residential workshop saw the translation and inbuilt peer-to-peer review of over 60 level 1 picture books for children to Haryanvi. The workshop was organised with the support of Mr. Pramod Sharma , a senior Education Department official in the Haryana Government. Amna Singh, Consultant Editor, Pratham Books helped organise the hackathon. "The energy of the educators translating the stories and the excitement of the students peeping in and watching the stories take shape was palpable. These children have never before seen or read a storybook in their mother tongue language, and neither have their teachers! So yes, in a way, history was created. And hopefully, the first step in the journey of documenting a predominantly oral language to safeguard it for the coming generations has been taken from Gorawar, a village in Rohtak, Haryana. And StoryWeaver is proud to be an enabler in this endeavour." Participants are all smiles after the translation hackathon. The Ladakhi language also called Bhoti or Bodhi, is a Tibetic language spoken in the Ladakh region of India. 17,000 Ft Foundation, is an organization that works to improve the lives of the people of remote, high altitude mountainous villages of Ladakh. 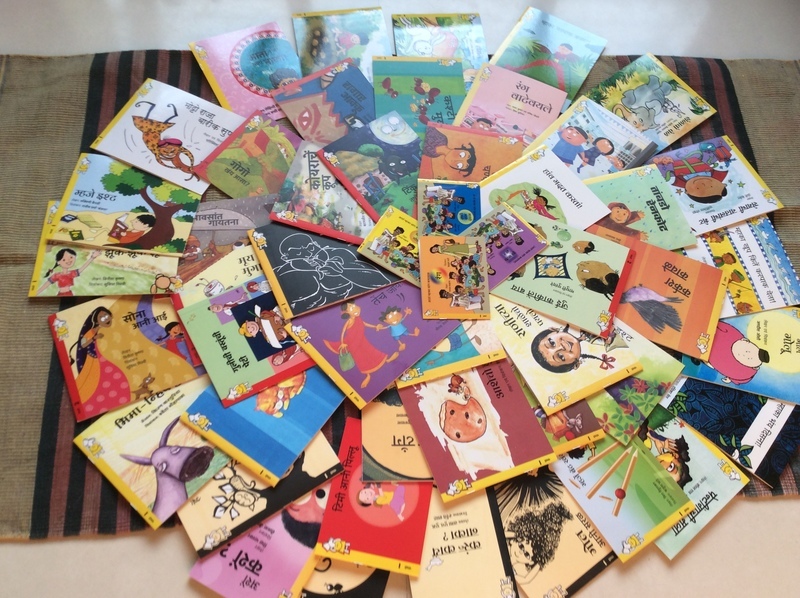 In 2015, the organisation collaborated with Pratham Books to translate Pratham Books titles to Bhoti and distributed printed copies of these books to over 350 schools in the region. We have added ten of these Bhoti stories to the StoryWeaver platform, and will add more stories to the platform over the course of the year. "Six years ago, 17000 ft Foundation bought its first set of titles from Pratham Books for its libraries, an encounter that helped reach story books to children living in the remotest and most inaccessible corners of high altitude Ladakh. A first in a region where the only books available to children were textbooks in English, these books helped fire up the imagination of little children and helped draw them into a world of reading. Things then got even more exciting a couple years later when we translated 10 titles from Pratham Books into the local language, Bhoti, and distributed it across thousands of children in Ladakh. Today, the request for more story books in Bhoti pours into our office every day and StoryWeaver has made that process more easy, accessible and enjoyable. The privilege of making these wishes come true is all ours." shared Sujata Sahu, Founder of 17,000 feet. How are you celebrating International Mother Language Day in 2018? Will you share a story in your mother tongue with children? Will you give your creativity a space to flourish and write or translate a story your mother tongue? However you decide to celebrate, share it on Social Media and tag us @pbstoryweaver!